With good will render service, as to the Lord, and not to men. When we think of noble professions, we nearly always think of those that offer a service, such as teachers, doctors, or lawyers. At the top of the service professions are those who are involved in full-time ministry...the helping of others in their spiritual lives in the Name of the Lord. We tend to revere most highly those who make a commitment to serving God and others: pastors, priests, missionaries, evangelists, and Bible teachers. Ministry, however, is not limited to those who earn their living by it. Ministry is the call and challenge of God to all Christians. Ministry is giving to others and living our lives as unto the Lord. Ministry happens in the home, in the school, on the street, at work, at meetings, in the Mall...everywhere. It happens wherever and whenever a person, motivated by the love of Jesus, performs an act of loving service for another person. If we, as God's children don't take very opportunity He gives us, to reach out to others in love, telling them that Jesus loves them, and that they can have eternal life, be forgiven of all their sins, we are going to allow some of His precious children, to be lost forever. We will answer for this too. God lead that person/s to us for a reason...we should never pass it up. There is no dishonorable work except that which is void of ministry! There is no lack of meaning in any job performed with God's love and "as unto the Lord." Whatever the tasks you face today, perform them as if you were performing them for Jesus Himself, because ultimately you are! If we practiced doing everything we do, everything we say, everything we think, in the Name of Jesus, we would be a lot more watchful of what we say, do, and think. 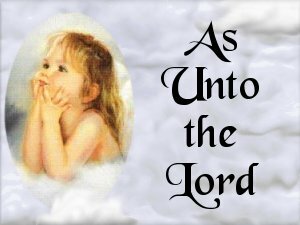 So in all that you do, do as unto the Lord! This page is from Our God Reigns Daily Devotionals.� Used with permission.